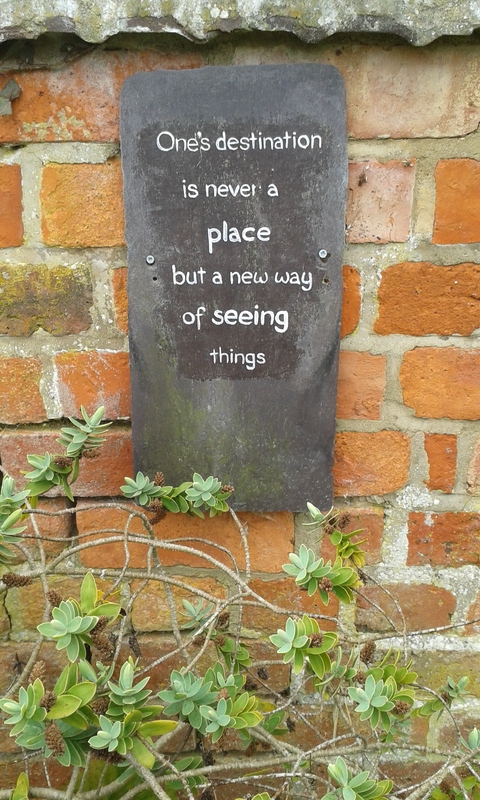 On this, the second anniversary of starting my blog, I wanted to share with you a photo with a quote that encapsulates this painful, terrifying, wonderful process of recovery and therapy, which I have been writing about for the last two years. It shows why the way we navigate through this process is not by means of a route indicated on a map; but by means of a relationship, built together with another person. A very special sort of person called a therapist. This blog and this writing is dedicated to my own special person, my therapist who I love dearly. Everything I have written over the last two years is in one way or another a product of our relationship – it is a record of our work, as it manifests in my thoughts, feelings, words and actions. I am very thankful for the work already done, for the work still to do, and for her unwavering commitment to me throughout, even when I doubted it most. She may be my ‘safe place’ but we both know that therapy is not the ultimate destination – yet to know her even for a few years is a privilege and something I would not have wanted to miss out on. She helps me to grasp new ways of seeing things all the time, not least about love – its presence, and its presence in absence. I am so grateful for her; and I am looking forward to sharing with you whatever the next two years and new ways of seeing things, may bring. Categories: Poems, quotes and music, Therapy | Tags: BPD, mental health, quote, recovery, therapeutic relationship, therapy, therapy is a different way of seeing things | Permalink. Once again I appear to be behind the times – this picture has been spreading across the internet like wildfire for quite some time, but I only came across it recently. Apologies to whoever is responsible for the image, for the lack of attribution – I can’t find one anywhere! The picture made me smile as soon as I saw it – and then I felt silly for smiling, as part of me thought it was quite plainly one of the most ridiculous pictures I had ever seen. And I had never quite understood what appeared to be the mental health world’s fascination with unicorns. (I make this gross generalization based on the fact that when I first started reading mental health blogs, I came across captioned images of unicorns on a very regular basis). But the fact remains – I still smile every time I see this picture. It actually makes me happy to look at it. Maybe it’s just that I love kittens. To the extent that I can almost ignore the fact that this kitten has an odd sort of protrusion on its forehead. But in this context, even that seems apt and appears to have a place – if anything can be said to ‘have a place’ in this bizarre creation of ridiculous (some might take that literally) cuteness. To be serious for a moment – if that is possible under the circumstances; this one picture brings together some powerful symbolism, and that, undoubtedly, is part of its appeal, particularly in relation to mental health. Depending on the context, rainbows symbolize hope and/or freedom; unicorns remind us of gentleness, innocence, mystery, beauty – or, indeed, of almost any positive virtue. They are a symbol of ‘the good’ – and at the same time their mythical and mystical nature is a representation of our longing for something perfect and unattainable. As for the butterfly – it is a powerful symbol of transformation, and in the mental health world it is also associated with recovery and self-care; the ‘butterfly project’, for example, aims to support and motivate individuals who wish to stop self-harming. As for the kitten – well, a kitten is a kitten. It’s adorable – who could resist? (I’m going to ignore the dream interpretation website I saw, that claimed that kittens are a symbol of sexual fantasies and irrational beliefs. If you start believing that the rainbow butterfly unicorn kitten is real, I will direct you to that website). 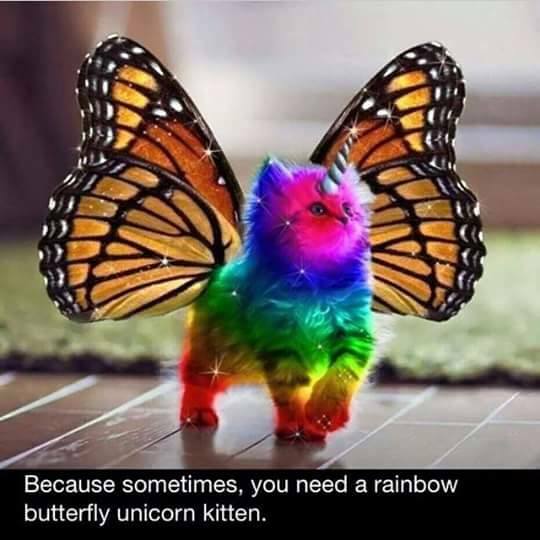 So, sometimes, it seems you really do need a rainbow butterfly unicorn kitten. Or, at least, I do. How did I never realize this before?! Categories: Poems, quotes and music | Tags: borderline personality disorder, BPD, depression, hope, humour, mental health, mental illness, rainbow butterfly unicorn kitten, recovery, self-harm | Permalink. I absolutely love this picture, which was shared through Facebook today via the mental health charity SANE. I wish I could credit the picture, but although it pops up in a miriad places on the internet when you google it, I cannot find an attribution anywhere! 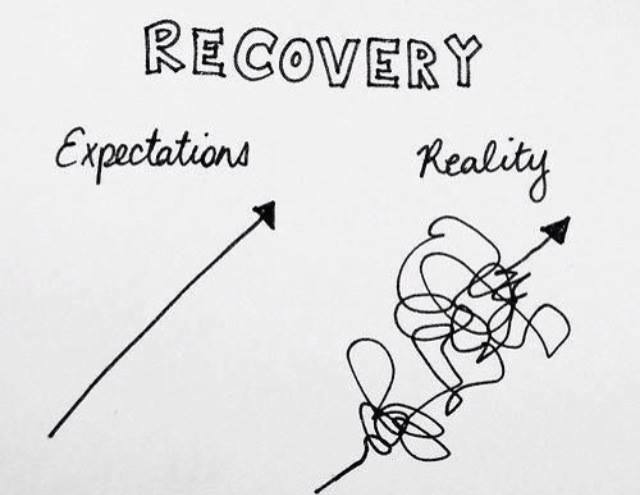 The scary cliff-edge at the end represents the fact that it is pretty much impossible for me at the moment to visualise a future in which recovery has actually happened. Alternatively, think of this picture as the random walk of therapy, with the cliff-edge representing the terrifying prospect of ‘termination’. Or imagine recovery as a battle – that’s easy to do. For many people with mental health difficulties, every day feels like a fight: a fight against your thoughts; a fight against your feelings; a fight against your impulses; a fight against other people and their perceptions; a fight against your own self, or a version of yourself that wants to keep you trapped in misery, fear and self-loathing. Sometimes recovery can feel as though your enemy is shooting arrows as straight as the ones on the left of the top picture, that pierce straight through, leaving you bleeding out. Whereas it feels as though you are shooting arrows as twisty as the ones on the right – even if they hit their target they penetrate a little way and then get stuck, or simply dislodge and fall to the ground. If you’re a soldier at war with mental illness, you might like this track called ‘Recovery’, by James Arthur. The video contains an interesting visual for another feeling that I sometimes associate with recovery – the sense that I am stuck on a particular track, going round and round in circles, not able to break out of the infinite loop of my experience, but desperately wanting to. This song reminds me that however helpless I may feel, and however trapped in that loop I may feel, recovery is possible and it is within my hands and my direction – even if that direction resembles a tangled trail of spaghetti. Categories: Poems, quotes and music | Tags: borderline personality disorder, BPD, humour, mental health, mental illness, recovery, recovery from mental illness, therapy, what does recovery look like | Permalink.